Deep Creatures opens the 2017 Mayor’s Night Out Concert Season. 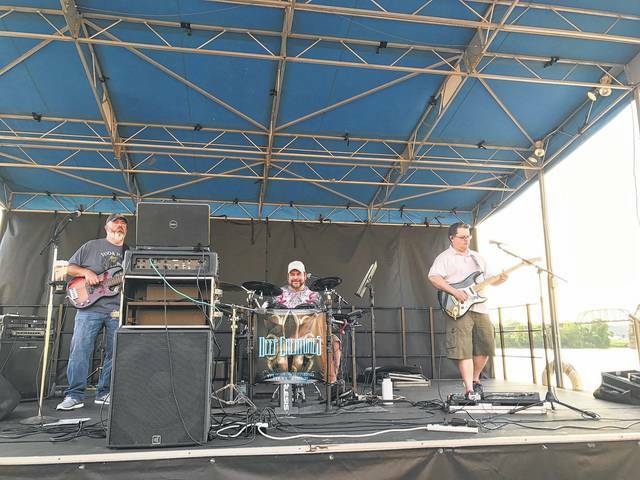 GALLIPOLIS — Thursday evening, in the Pavilion, on the grounds of the French Art Colony, The Deep Creatures will be the featured entertainers. This popular Southeastern Ohio band, formerly known as Stillwater, experienced tragedy with the loss of their band mate and founder of Stillwater, Kevin Jolley. After the loss, they felt it was time for a change and a new identity. The Deep Creatures are a trio of Roy Mayes, BJ Rocchi and Kent Jolley. The band has decades of combined experience, performing many genres of music. They have influences ranging from bluegrass to heavy metal and have left no musical stone unturned. With a strong live show, refreshing original material and a song selection geared toward pleasing an audience, it’s time to go Deep, with The Deep Creatures. Thursday, the gates at the Pavilion at the French Art Colony, will open at 6 PM, with food available for a donation and legal beverages for purchase. The music will begin at 6:30 pm..
Also available for sale, will be tickets to win a stay at a beachfront Garden City condo. Tickets are $5 each, or three for $10. A winner will be drawn on the final night of Hot Summer Nights, August 30. All proceeds from the ticket sales will be used to purchase fans for the Pavilion, to make it more comfortable, during the hot summer months. Admission is $5 per person and is free for FAC members, as a benefit. For a full schedule of the live music performances in the Pavilion, each Thursday evening through August, or for any additional information, call the French Art Colony, at 740-446-3834.